I love Target. Seeing those Dollar Bins right inside the doors thrills me. I know. Get a life, right? 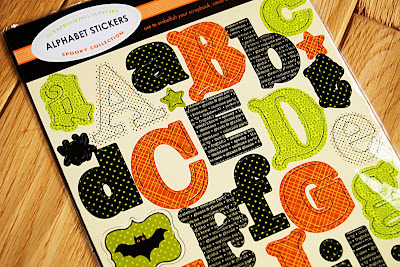 Today I found these fabulous Halloween letters stickers and it made me think I'd better share my Halloween countdown calendar with you all in case you want to make on and save your sanity - or at least a portion of it. How will it do that, you ask? I don't think I'm the only one who gets tired of the same question every day, sometimes asked repeatedly throughout the day. "What's for dinner, Mommy? " I'm baffled as to why they still ask this. Being the Mean Mommy that I am, my answer is almost always "food". This started because I used to not plan ahead so much and I had no idea at that point. I'm getting a little better, but the question drives me crazy, so I still tell them "food". Well, "When is Halloween?' starts the split second a leaf turns orange or the chill in the air returns. 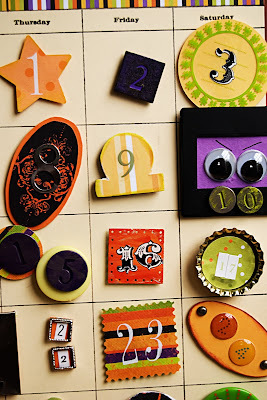 This project makes a nice decoration, serves a purpose and the kids really enjoy taking turns taking the date off the calendar. 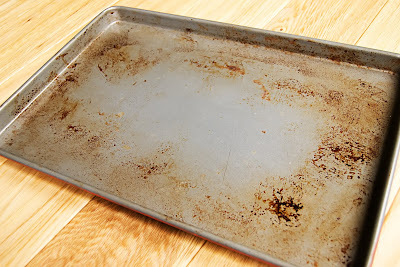 I got my money's worth out of this baking sheet and knew I wanted to make this project, but any cheapie baking sheet you can find will work, too. I painted the edging and part of the front with orange acrylic paint. I didn't spray a sealer over it, but did put on two coats. 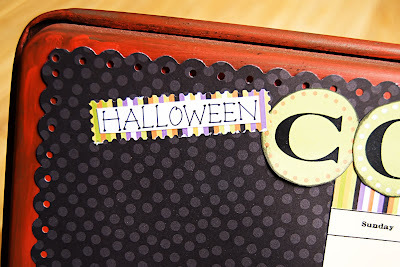 Next, I used manilla paper and measured out squares for the dates and smaller rectangles for the days of the week. I used rub-ons for my days of the week, but you may have lovely handwriting - me, not so much. Playing around a bit, I decided where I was placing different elements of this calendar. I came across a cute little 99 cent card with this kitty on it and wanted to use it. 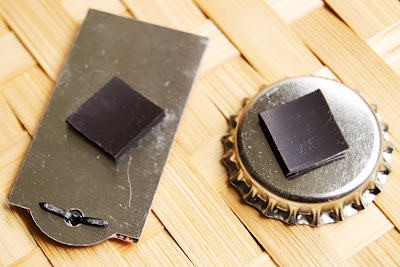 I know the kiddos will outgrow the cuteness eventually, so I placed magnets on the back instead of adhesive. 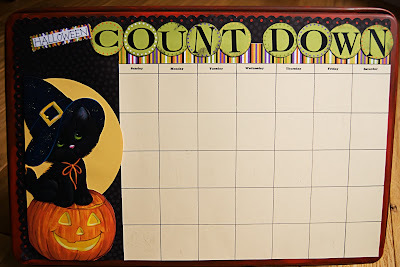 Once I knew where everything was going, I cut my black dotted paper to cover the baking sheet not covered by the calendar. I used a decorative edge punch on the black paper and glued it down. 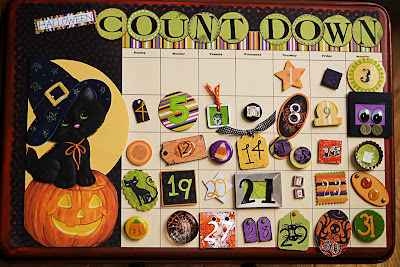 Glue down the "Halloween" (also came from the greeting card), the "countdown" and the empty calendar. Now the fun begins! 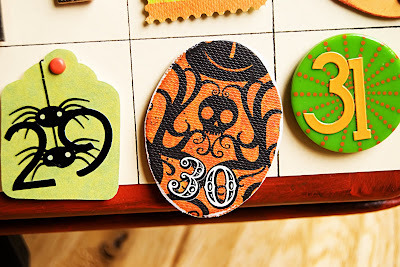 Dig into your stash of number stickers, decorative papers and all those crafting goodies I know you've got hidden somewhere. I used a bunch of metal tags and metal numbers made by Making Memories which I've had for years. Some shapes were just paper punched and stickers applied.I used a couple of button pins I think I found at the dollar store. I had googly eyes left over from another project and glued them on a slide holder. Anything goes! 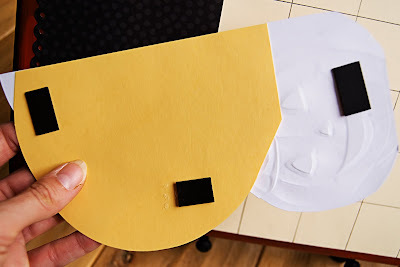 Once done, just cut pieces from the magnetized roll to fit on the back of the dates. I got my magnetic strip at Hobby Lobby. Rather than look at a blank calendar much of the month, we opt to put all the dates on and take them off one at a time and place them in a little basket after dinner each day. 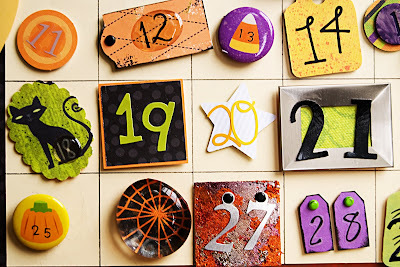 If you happen to not have a bunch of products, or much time, you can still make an easy version of this calendar. Go get some stickers from the dollar store and place them one at a time on a school calendar or family calendar the little ones can see and reach. Works just the same! :D Now they can look at the calendar and figure out how close Halloween is all on their own! If you're in need of a creative jump-start, go to twopeasinabucket.com. You can find greeting cards, scrapbooking pages, photography and projects like this. I get tons of inspiration from everyone on there. i think this looks like something I could attempt!!! hey - your e-mail address is bouncing back to me for some reason this week. can you e-mail me at bhamgirl717 at aol dot com? Hi Traci, that is a cool thing to do with a baking sheet. I so want to make one for Christmas. Had so much FUN making one of these!!! Thanks for the inspiration!!! I'm not making a countdown calendar...I'm already waking up in the middle of the night, worried about halloween, since emmet told me he really wants to go trick or treating as his favorite, obscure Pokemon character, cacturne. No luck finding a ready-made costume this year. I wish you lived nearby and I could commission you to make it...I guess I'll just have to cry "HELP" when I get to Joanne's Fabric and pray some crafty salesperson will take pity on me.